If you follow my social sites like Instagram or Facebook (which I hope you do!) you’ll know I’m really big about my gardens. Next year we’re doing a big overhaul and they will be 6x the size it is now. I’ve been having the kids make Handprint Garden Stepping Stones to place along the walk ways of all the raised beds. There are several ways to make these and we’ve been making all different kinds this summer. 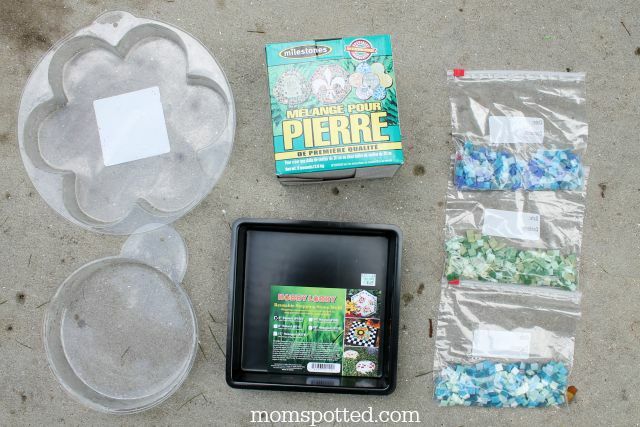 If you know you want to make many of them you might be better off purchasing molds separately along with stepping stone mix and some stones, mosaic pieces. If you go this route you’ll need some basic supplies. If you aren’t sure if your kids will cooperate or just want to keep it simple you can also go with a kit. We think both are great. If you like the kit I use in this post you can buy it at a craft store or on Amazon with free shipping. 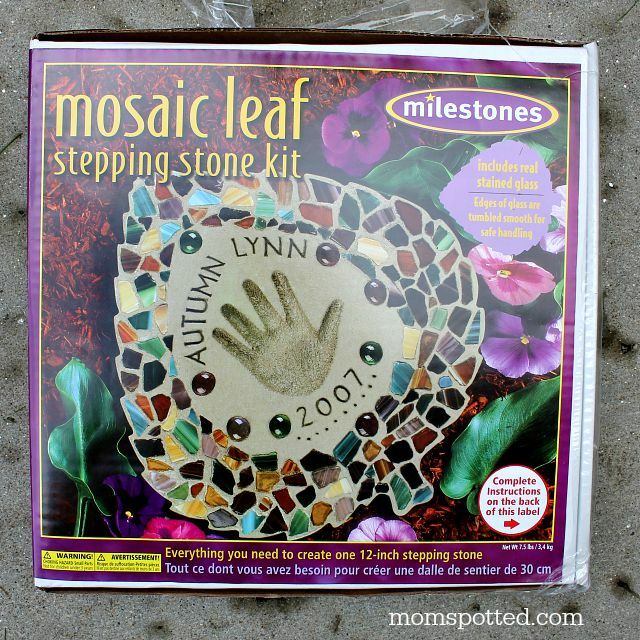 It’s called the Mosaic Leaf Stepping Stone Kit and it is by far my favorite kit! 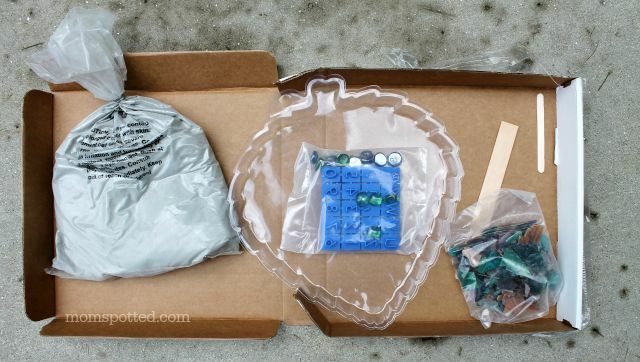 A kit is a great way to get started as it has a lot of the needed supplies all together. This one even comes with the stampers! Mix your stepping stone cement as directed. When adding water remember to start with only a little and add more as you need it. If you make it to watery it won’t hold the handprint or the stamps. Then pour the cement into the mold and let firm up slightly. Then take your child’s hand and have them push it into the center. It might take a few tries, I know it did for us. 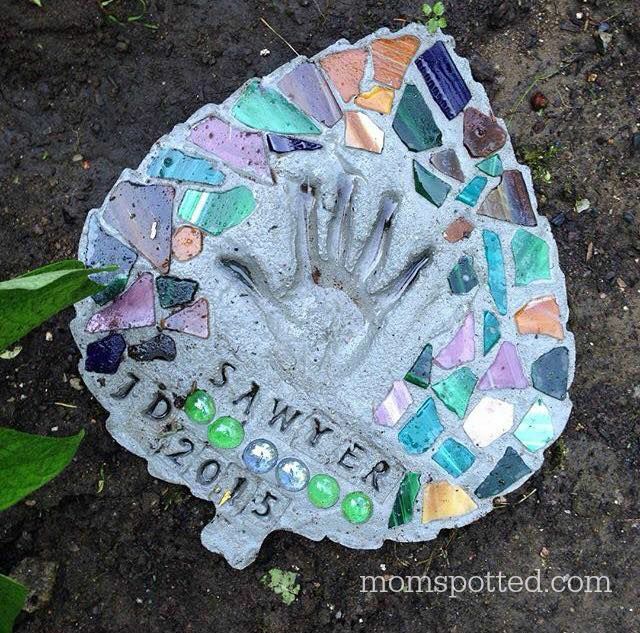 Sawyer kept trying to grab the cement and it was a struggle to get him to push while keeping his hand flat. 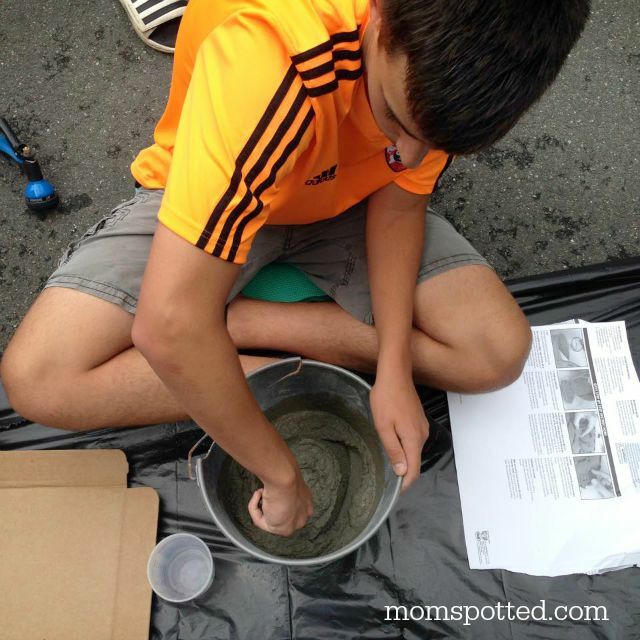 Don’t worry your cement doesn’t dry super fast so take your time and make sure you like it. Then you can decorate. There’s no wrong way to do this so have fun! Our cement was still pretty loose so we thought we’d leave the stamps in for a few hours. We pulled them out before it was dry. If you didn’t go with a kit you can make your own designs. Here is one my oldest made because he didn’t want to do his handprint. He also thought he’d be funny and set a dime on it just enough to look like it fell and could be picked up. It will take a couple of days to dry. Make sure it’s fully dry before removing from mold. Cement takes a month to fully cure so if possible don’t stand on it until after that. Next on my list is this cute Pet Photo Stepping Stone Kit! 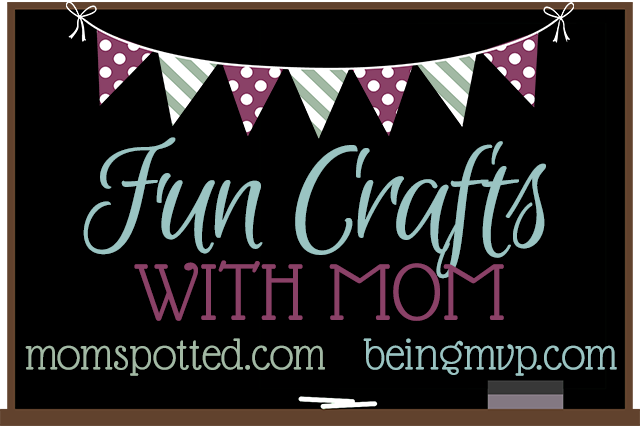 Every Monday we want you to come and link up your latest craft you made with your kids and share here! Now head on over and check out Being MVP’s DIY Music Shakers. This is a very pretty diy! I would love to do this with my nieces. 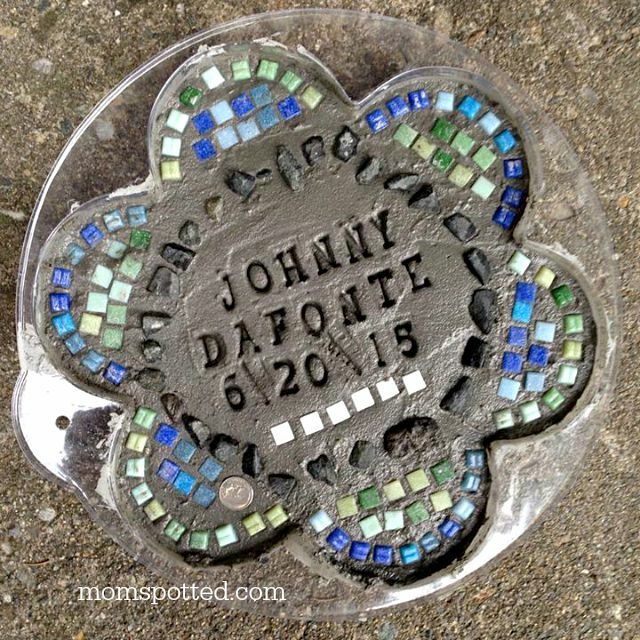 These are a great idea, you could aso embed stones collected from vacation spots and do one each year. 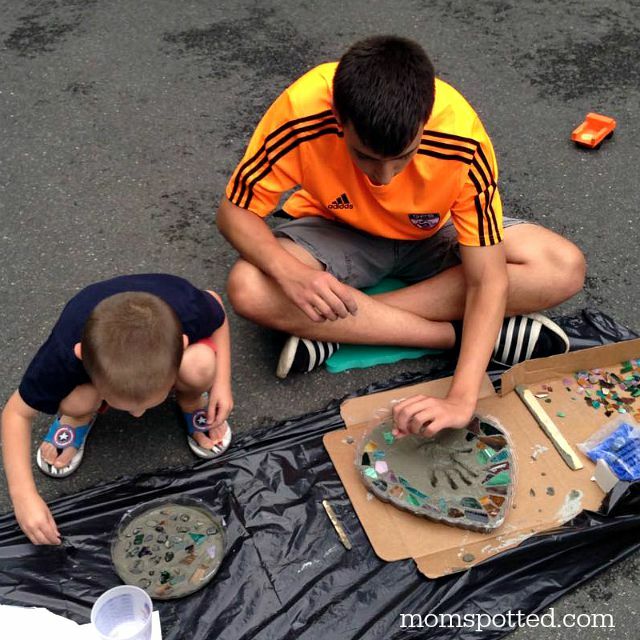 Great DIY projects with kids/grandkids. Amazing projects that look so cool and make great gift ideas. Thanks for the posting and pictures. Kids are going to love this (and maybe adults too!) My 4yo niece and wife are going to do these, our niece can;t stop asking when. Thanks for the great idea. 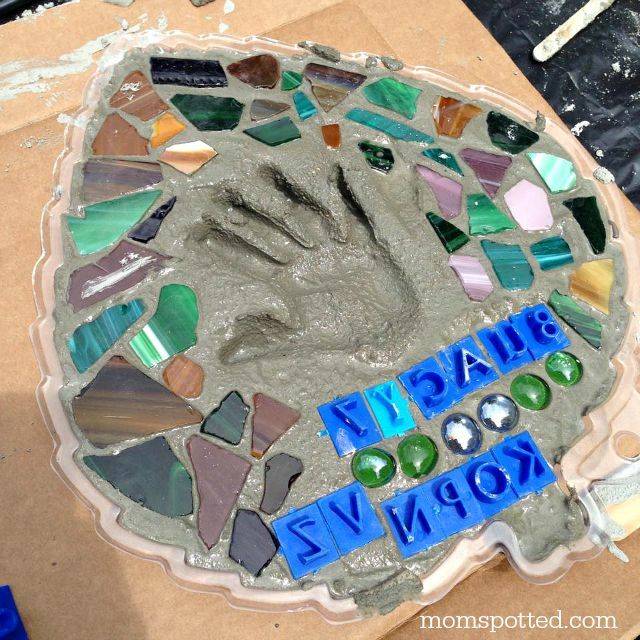 This looks so fun and it’s a great keepsake!! thanks for sharing! Fantastic Diy Idea.. I ll share this with my kids and they ll be so happy… Great pics …Thank you so much for sharing the idea. 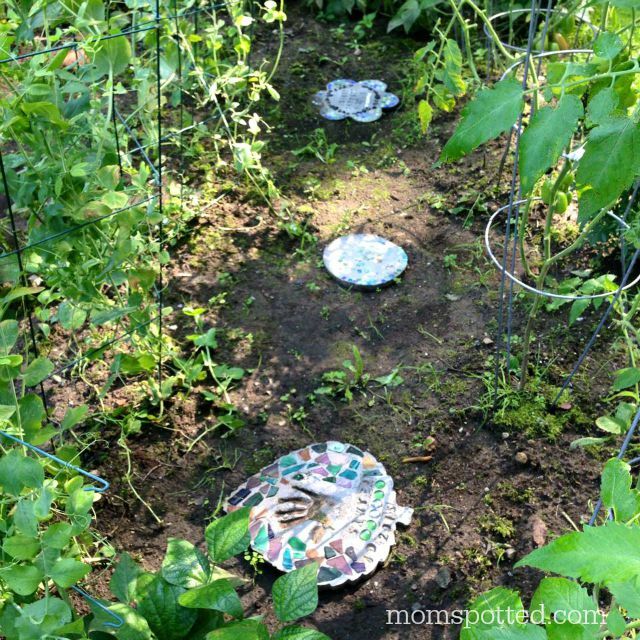 Love a great DIY idea! Especially to keep busy in the summer months. These are so cute! I’d love to make some for my dogs as well. What a cute and creative idea! They are too nice to step on! These look so awesome. Can’t wait to try this with the kids. The hand prints will be great to look back after many years. pretty amazing. im going to try this with my kids. thanks for sharing. Great idea to use with the kids as we enjoy a nice warm day outside listening to music! 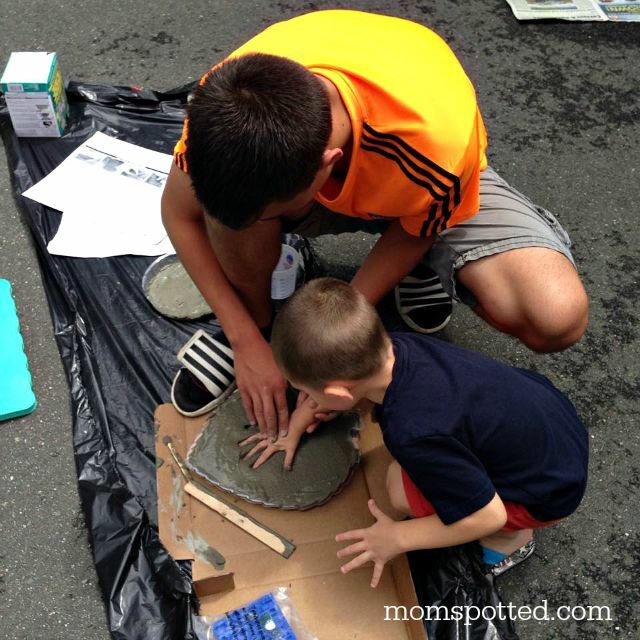 Great activity for parents who want to bond with their kids. Easy to do and it’s something you can keep for many years as a good memory. Love this post! Our kids have enjoyed this greatly everytime we have done it. This is just way too cute. Going to print this guide out and purchase this kit for nieces upcoming birthdays. Thank you so much for sharing. Looks like a great idea that the kiddos will absolutely love. You’re the best! Like the step by step instructions – think I am going to try this for my daughter’s upcoming birthday party. I swear I am dropping a hint to my sister in laws that I want som of these. I have nieces and nephews who could make them, and I would love them even more. I really like the homemade gifts they do. Really like the look of it and how it can be so fun for the kids. Going to do this soon! They look so awesome! These are fantastic ideas to get children involved in working with their hands, develop skills and get them away from the TV! Thanks for the post! I’m an older dad (55) and always looking for cool things to do with my little girl. Thanks for posting this. She’s gonna love getting dirty with Daddy. Thanks for the great articles. My wife and I are always trying to figure out cool and creative things to do with our little girl and to avoid the trap of “digital heroin” (for lack of a better term) and letting her watch movies or TV on an iPhone. Researchers are saying that it stunts their ability to learn, imagine, be creative and pay attention later in life. So I found this article to be a good read for what we are doing. Another cool thing as we approach Valentine’s Day that your readers might enjoy is for each day leading up to the holiday ad starting today is to cut out a paper heart and write one thing you love about your child each day leading up to the 14th. We started today and our little one loved it. Thanks again!